Similar to triple ko, a quadruple ko involves four kos on the board that are all in play at the same time. Often they are part of the same configuration, as in this example. A double ko and two separate kos can also form a quadruple ko. A quadruple ko may lead to a game ending in no result if neither player is willing to back down from the ko fight, though some modern rulesets handle it with the superko rule. Fifteen examples of pro games ending in quadruple ko are given on Quadruple Ko. In the preliminaries for the 25th Kisei, the game on April 6th 2000 between Doi Makoto and Hasegawa Sunao ended in no result due to a quadruple ko that occurred relatively early in the game. 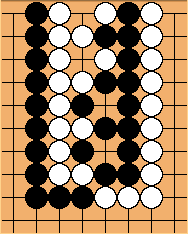 The game was replayed, with Hasegawa winning. An amateur game from the 2003 Frankfurt Go Tournament (Simon Kober 16 kyu versus Bjoern Wenzlaff 18 kyu) also included a quadruple ko. A photo is on the cover of DGoZ 3/2003. In the 2012 17th Samsung Cup, a quadruple ko occurred in a match between Gu Li and Lee Sedol SGF and background info.